Note from Davonne: I have received an unbelievable amount of messy photos and questions for the Get-Organized challenge. I just want to extend a huge THANK YOU to everybody who has jumped on board with participating! In order to answer the responses in a timely manner without nearly killing myself, I’ve decided to bring in a few experts to help me out. Today’s messy situation is being handled by Jennifer from Organized Home Organized School and the recipes on her blog are making me hungry! 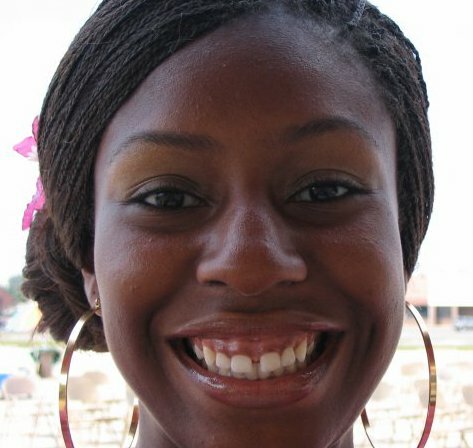 Hi there, Davonne Parks’ readers. My name is Jennifer and I blog over at Organized Home Organized School. I am pleased to be sharing with you all today one of the reader submissions for a more organized space. 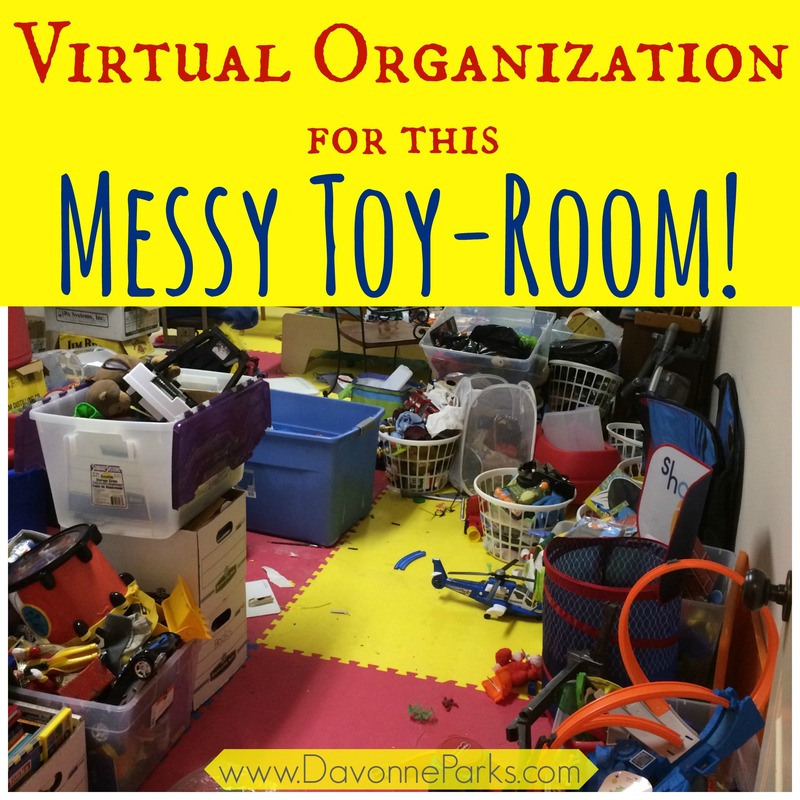 Today we will be talking about playroom organization. First, let me say this is an organization challenge I can definitely relate to. 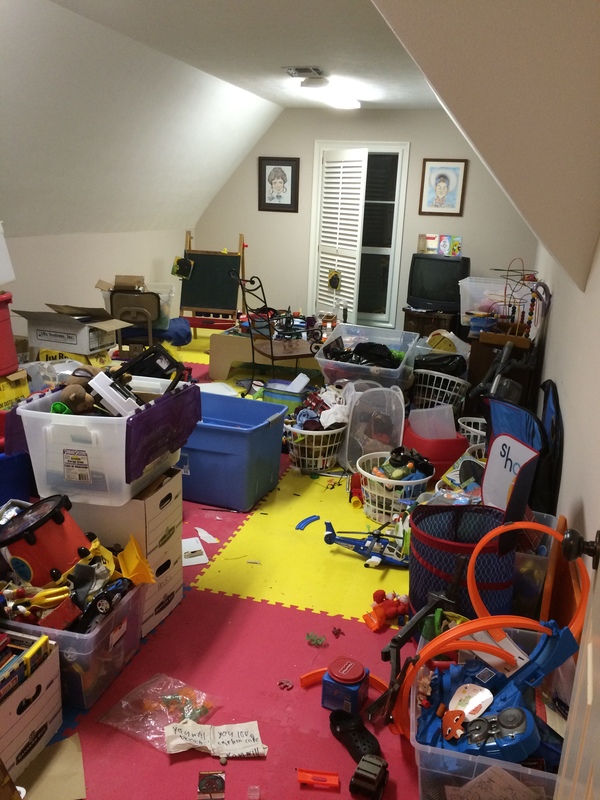 With 2 rambunctious boys of my own (and a 3 year old princess that thinks she can do everything her brothers can), it used to feel like their room was closing in on me with all the toys around. A space can feel so much smaller because of the clutter. Solution 1: The first thing I notice in your picture is that are a lot of bins and buckets and totes. While containers can be a great way to corral toys, it may not be the most visually pleasing option. Since you and your son are very visual, I would suggest storage that displays a certain number of toys. 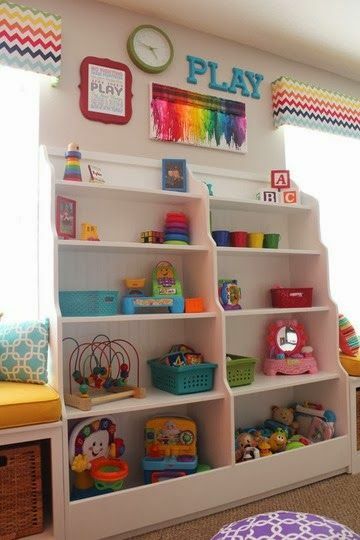 It can add interest to the room, as well as keep favorite toys out in the open since they will be played with regularly. Here is a great example of this concept in action. In the photo above, There is a dedicated space to showcase certain toys. Keep in mind that the toys that are put on display will get played with the most since they are already out in the open. The key to this type of organization is minimizing the number of toys on display. Notice the spaces in between the toys on the shelves. That space keeps the shelves from feeling stuffed and over-filled, which can make the whole unit and maybe the room feel cluttered. In my experience, in order to purge effectively, you have to be willing to part with some things that you no longer need. This was a tough one for me to accept in the beginning. I seem to have a sentimental attachment to a lot of things. However, as I began to let more things go, I realized that the stuff really wasn’t as important as I thought it was. Only you know what is worth keeping and what is worth purging, but I would encourage you to sort through the toys and keep only what your boys really play with. If you are having doubts about getting rid of some toys, this post offers some very helpful ways to know when it is time to let go. 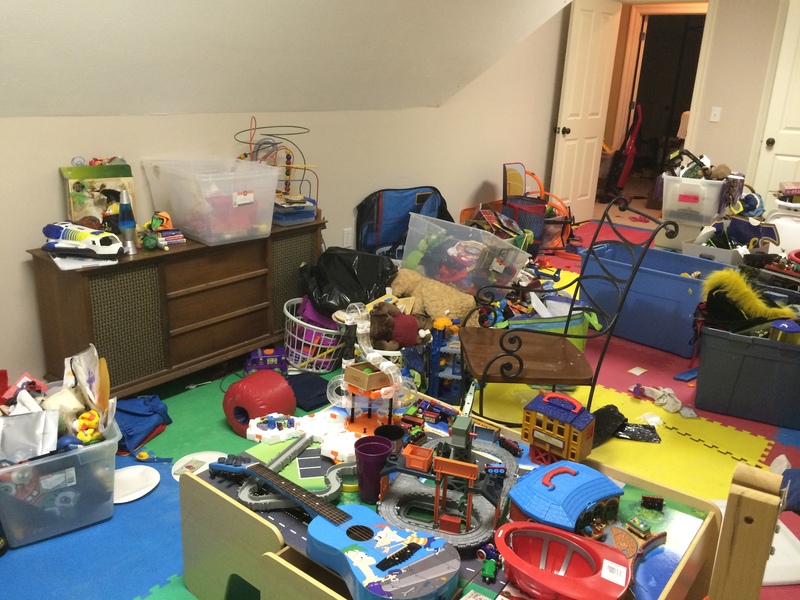 Create Piles – Make a keep pile (toys that are definitely played with), a throw away pile (broken toys, or toys with missing pieces) and a donate pile (toys that your boys have outgrown or that they don’t have an interest in anymore). Go through every toy and put them in one of the piles. Once you have sorted through all of them, do it again. What I have found is the first time I sort items, I still try to hold on to some things that I don’t need, but if I go through my piles again, I’m more willing to let go of them. Get The Kids Involved – This may seem counterproductive, after all, won’t they just want to keep every toy? Maybe. But this is a good time to explain to them why you are purging and organizing. Help them to understand that all people, even adults, have to get rid of items that they no longer need in order to make room for other things. Maybe make a special trip to the donation center together so they see where their toys will be going and so they can think about who may get the privilege of playing with the toys next. First let me say I love the multi-colored puzzle floor you have in your playroom. It looks so fun! You might think about adding some fuzzy rugs as well. Rugs always bring a room together and make it feel cozier. 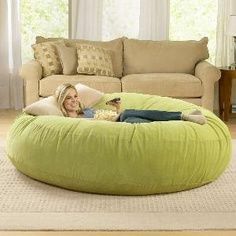 Over-sized beanbags or a soft sofa would also be really inviting. Shop your house – you may already have something that isn’t being used much. Go ahead and put it in the toy room to see what you think! One word. Zones. You have such a big awesome space to work with, that I think zones would be perfect for it. 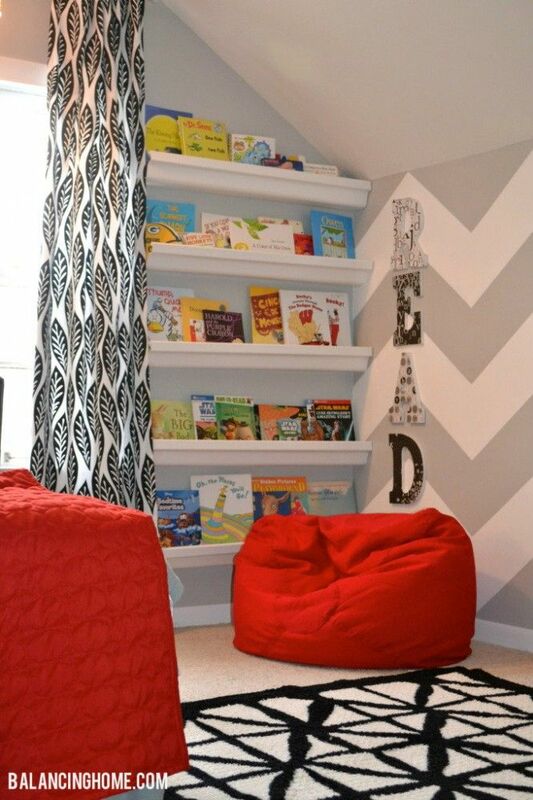 Making designated areas where an activity can be done will help keep the room organized as well. For your youngest boy(s), create a zone with a table where they can pull out puzzles and board games. Include a rug for floor play. For your oldest son, he may enjoy some of his favorite things displayed on shelves or hung on walls. He may also enjoy a table for building or crafts. Don’t forget the sofa/seating area for cuddling, and remember to check your house to see what pieces of furniture you already have that could work! 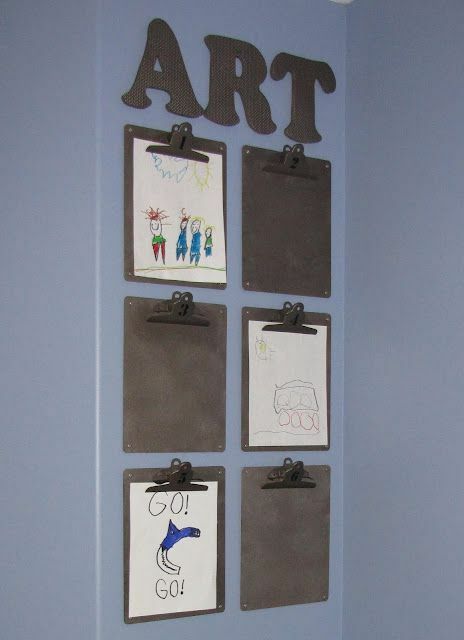 A chalkboard wall What kid (big kids, too!) doesn’t like writing all over a chalk wall? 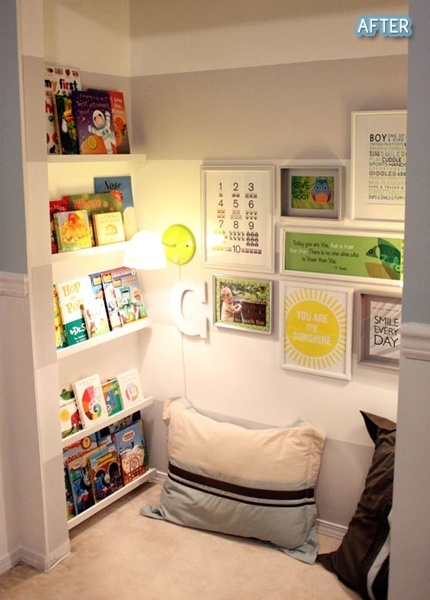 Reading Nook This would be a fun idea in the room or if you have an extra closet in the room. Just remember to keep it fun and cozy by limiting the number of toys you keep, and making a space that everyone can enjoy together. Jennifer Renee is the creative writer behind Organized Home, Organized School, where she blogs about making 1000 sq ft a pretty and organized home for her family. She and her hubby reside in the Midwest, where she spends her days classically homeschooling and carpooling her three children. She enjoys a good organizational project and can be found any day of the week waste deep in her cabinets and closets rearranging them. When she’s not organizing the pantry, she can be found curled up with a good book or engrossed in the latest tech news. What great suggestions! I absolutely love the idea of separating this room into zones. These are all very doable and will bring this Mommy some sanity in the playroom! YAY! Please share success photos when you’re finished! !